Come to the gems show this weekend at the Peoria Civic center. Times are Saturday-9-5 and Sunday-11-4. 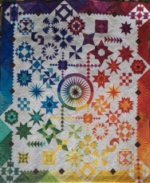 There will be 400+ quilts on display. We hear the vendors are good too! Oh, did we say that Quilter's Garden will be there? Come down and see me. We will will be showcasing one of our new runners- One Hour Border Runner. Of course we will have many on display! Hope to see you in Peoria!